Firstly I would like to thank GrandView for sending me this sample to review, as always I try to write honest reviews. This unit received over 50hrs of burn-in, no differences were noted. The SA-50 comes in a simple blue and yellow card box, the amp is held tightly in place in foam, and the power supply is also well secured. The box is nothing fancy or special, but serves it purpose of protecting the amp during transit. 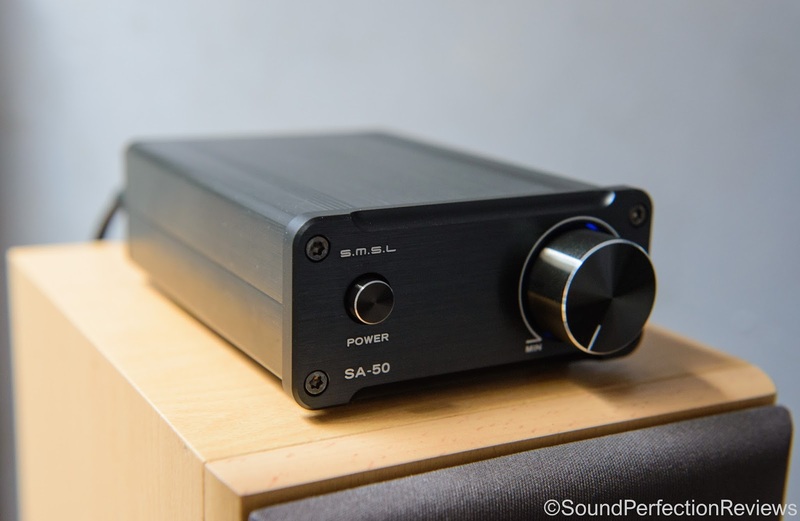 The SA-50 is a well built amp in my opinion, the metal chassis is very well finished without blemishes. The volume knob operates very smoothly and the inputs and outputs are all of good quality. The on/off indicator is a blue light that forms a ring around the volume knob, I really like this as it is very subtle and not a glaring on/off light. Accessories are not included, you get the amp and power supply, that is it. Not really anything else that could be useful though, so not an issue. 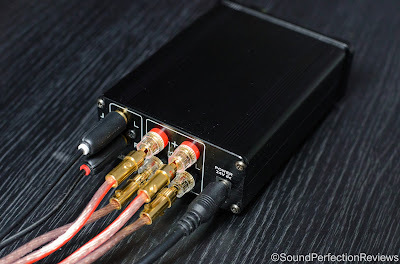 The amp is rated at 50wpc, has a single pair of RCA inputs, and a pair of outputs so you cannot bi-wire speakers with this amp. The speaker terminals are quite small so won’t accept cables larger than about 12awg, however they accept standard 4mm z-plugs so it’s easier to use terminated speaker cable over bare wire. The amp never even gets warm, even after being used for hours. I also didn’t have noise floor issues, it isn’t dead silent, but there is minimal noise and it is not even noticeable when playing at all, I have to put my ears right up to the speakers to hear the slight hiss with no music playing. The SA-50 is a powerful little amp (high gain) I had to turn down the volume of my source to get usable volume range. There is channel imbalance right at the quietest ranges, but this is quite normal when using analogue volume pots. 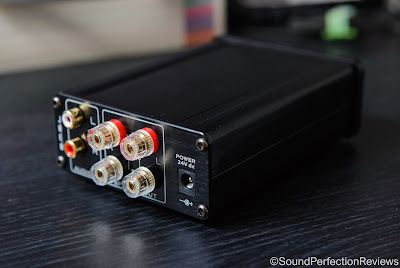 I am mainly using this in my near field desktop setup with the Denon SCM50 speakers and the amp brings out plenty of detail whilst powering them easily. I wouldn’t say the amp is 100% flat and reference sounding, I found there to be a little bit of a bass boost which brings out a bit more body from my speakers. It worked equally as well with my Mission 702e speakers, but again there is a little added body in the bass which the 702e do not need. I did find the bass can get a little uncontrolled at louder volumes, but for the most part it is well behaved. The stereo imaging is very good and the amp has a convincing soundstage whilst not being artificially boosted. Instrument separation is excellent and the synergy with my Denon SCM50 is very good. This amp is perfect for a small desktop setup, and 50w might even be overkill for most small desktop speakers. 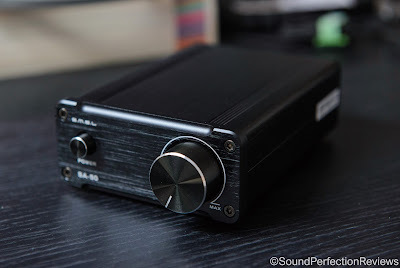 For the price it represents very good value for money, for a main setup I would still advise getting a proper integrated amplifier, but for a small kitchen, bedroom or desktop setup you cannot go wrong with one of these. Conclusion: This amp is only £51.99, and you get plenty of headroom with most sensitive speakers out there. For the size it can output plenty of power, and the size allows it to fit into many systems. I am quite impressed with it, the sound is well detailed with some extra body down low, that means if you find your speakers a little lean this amp will help. The sound is not as refined or effortless as a fully integrated class a/b integrated amp, but for what this amp is likely going to be used for you can easily overlook that. I know I do.